The catabolism of Met through the transamination reaction was proposed by Benevenga et al. (1983), and is supported by detectable levels of a-keto^v -methylthiobutyrate, 3-methylthio-propionate and methanethiol in urine of human subjects and rats (Blom et al., 1988; 1989a,b). An overdose of Met (30 g kg-1 diet) to rats resulted in an increased excretion of a-keto-'Y-methylthiobutyrate in the urine (Kasai et al., 1991). In patients with Met adenosyl-transferase deficiency, 0.2 Met was degraded via transamination. However, in normal subjects transamination did exist and was quantitatively not important in Met catabolism, even after Met loading (Blom et al., 1989b). No quantitative data have been reported for sheep. 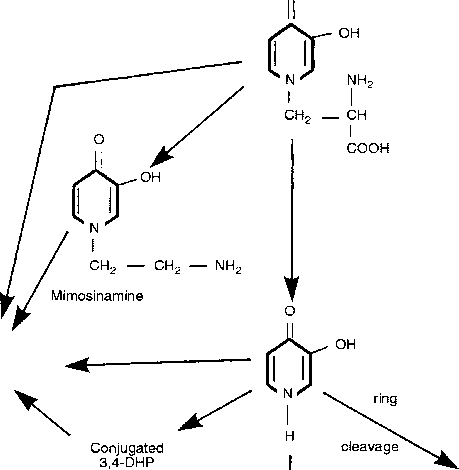 Recycling of the methylthiol group, which is derived from the aminopropylation pathway, back to Met via the transamination is also possible (Stipanuk, 1986). Aromatic amino acids are the preferred amino donors for the transamination of a-keto-7-methyl-thiobutyrate to Met in trypanosomatids and mammalian liver preferentially uses glutamine for this reaction (Berger et al., 1996). However, the physiological importance of the recycling of the methylthiol group to wool production remains unclear. It may compensate for some loss of Met via the transamination, but quantitatively, it seems unlikely to be important.